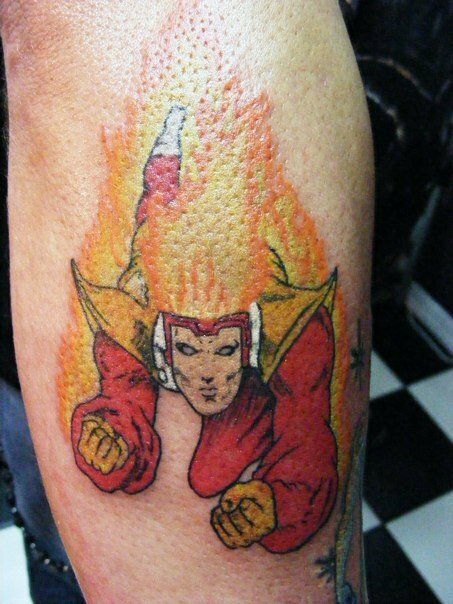 Check out this wicked-cool Firestorm tattoo! Lance Van Sant showed off his sweet-looking tattoo on the Facebook group, Forget Superman and Spiderman, it’s all about Firestorm. He was kind enough to grant me permission to display his tattoo here. Lance has demonstrated that he’s a true Firestorm Fan! In addition to the Firestorm tattoo, Lance also has an amazing Iron Man tattoo around the other side of the leg. Very cool! If you like this Firestorm tattoo, click here to see The Rev. O.J. Flow’s tattoos I posted last year.